The colour washed sketch of a ‘Cottage Yard at Quorn’ was produced by local artist W E Cooke around 1880. Its location was unknown, and assumed to have been changed out of all recognition, but now we know that the view was behind a row of three cottages, which is now one property, 2 Station Road, not far from Quorn Cross. 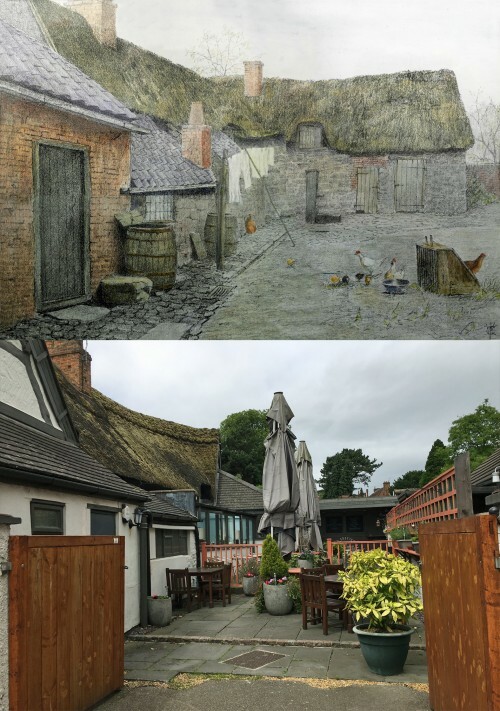 The prominent cottages are still thatched and currently occupied by Mio’s restaurant. The identification is further supported by older maps, which confirm that the main building on the left once carried on around the corner (as in the older picture), and also confirm the exact position of the pump. The museum team are massively grateful to eagle eyed Sian Clark, recognised the yard and got in touch! Missing information: Can you identify any more of the locations of W E Cooke's pictures?